GREAT WRITER FEELS GOVERNMENT SHOULD ESTABLISH OR CONTRACT OUT IT’S OWN COMMISSARIES, CLINICS, AND HOUSING UNITS. Lets face facts folks, anyone with an ounce of economic knowledge should know that the U.S. economy as is, is going to soon totally collapse. This policy I advocate is guaranteed to save the U.S. economy and restore our culture and morals all in one swoop. When government aids the poor and needy I advocate protecting the USA free market place economy from involuntarily inflating and driving the cost of living further and further out of sight. Also, I advocate the government establish or contract out it's own commissaries, clinics, and housing units. And use only stamps, tokens, or scrip for all who qualify and be limited for use in a government establishment only. By doing this it will stop the rise of consumer cost of living in its tracks. And it will also reduce and keep the cost of food and medical cost at a level where the working poor can pay out of pocket. The reason that will keep consumer cost of living prices at a level the working poor can pay, is because billion upon billions of government dollars won't be dumped into the U.S. private economy on an individual basis. Government dumping billions into the U.S. private national economy on an individual basis is what drives the cost of living out of sight. The "Amount" of money the government spends helping the poor and needy doesn't matter, it is the individual basis that drives the cost of living up for everybody. You simply can't have a genuine true free market place economy with billions of government dollars on an individual basis dumped into the private U.S. economy, period. And to add salt to injury the arch-evil 1938 socialist minimum wage law blocks the U.S. economy's purging power to protect itself and the nations culture and morals. I know a great many people totally disagrees with almost everything I write, and sometimes my own doubts creeps in, but duty forces me to push doubt aside. Also, I wonder sometimes if it's possible for the USA to be saved as a free nation. I see the USA culture, morals, and economy approaching total ruins, yet so many see life as business as usual. And the nuclear and extended family unit, which is the foundation for human survival is tossed aside and disregarded like a bad penny. God save my beloved homeland. Of course I advocate that government establishing it's own commissaries, clinics, and housing units should first test the policy. Start with a city like Detroit, they have a lot of empty building and if successful, then test it on one state, and if still successful go nation wide. SIRMANS LOG: 12 JANUARY 2017, 1955 HOURS. Almost everyone is setting around thinking that Obamacare or any insurance company is the problem with health care. Nothing could be further from the real truth on the matter. Medical insurance in health care is just a facade that hides the true villain, which is "Mr. ultra high cost". A word to the wise, when the cost of medical care gets above what the poor people's nuclear and extended family system can pay out of pocket, then that is a problem only a true free market place economy can solve, period. Once the evil 1938 socialist minimum wage law is gotten rid of entirely a true free market place economy will bring everything back into balance and save our great USA. Otherwise, the USA liberal march toward a failed socialist state will continue at warp speed. SIRMANS LOG: 09 JANUARY 2017, 2214 HOURS. WHO KNOWS WHAT TO BELIEVE ANYMORE, IS THERE AN AGENDA? As a writer of almost supernatural wisdom I will state this as a fact, Mr. Trump and the republicans has one last chance in a lifetime to save the great USA. That last chance is to repeal our liberal enacted arch-evil 1938 socialist minimum wage law. Otherwise, I believe they will fail big time and soon get the boot. Once the republicans get the boot thereafter the Dem's and liberals will have clear sailing to finish turning the USA into a failed socialist state. It is a fact that only a genuine true free market place economy with its purging power discipline can keep a nation free. Once the free market place is corrupted or destroyed in a nation it is only a matter of time before only an authoritarian government using an "Iron Fist" can maintain order, period. 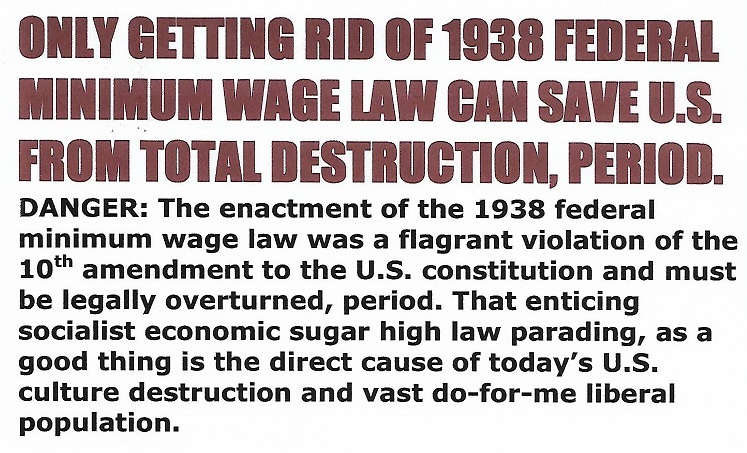 The evil 1938 socialist minimum wage law neutered and took away the purging power discipline from the USA economy. That is why this great country is split right down the middle with liberals galore, never in history has the poor ever been liberal and morally corrupted to the core. And they are killing unborn babies in the womb by the millions. God save my beloved homeland. SIRMANS LOG: 07 JANUARY 2016, 1913 HOURS. Folks, I am a self-made writer. And I want to restate that I know that 99 percent of the American (USA) people disagree with me on getting rid of our 1938 federal minimum wage law entirely. The reason for this wide gulf in belief is a lack of understanding on how a true free market place economy is supposes to work by the general public. One of the key factors in a free market place economy is "Buying power", But the 99 percent pro-minimum wagers never think about those words in the big picture. Ignoring "Buying power" is why sometimes it can lead to requiring a wheel barrel load of money to buy a loaf of bread. There is a simple formula when you have a genuine true free market place economy: "You can't get blood out of a turnip", which means no merchant can charge more than the poor can pay and stay in business. That is because there is never enough rich and well to do people to keep an economy afloat. You see government is not part of the economy, there are only two players in any economy and they are a seller (merchant) and a buyer (consumer). And if there is no thumb on the scale by the government favoring either side they will always balance each other and keep prices affordable for the poor. The problems begin when government won't settle with just collecting taxes and being a neutral referee for both sides. The shallow minded liberals discovered that under the pretense of caring about the poor they could stay in power by providing all kinds of free goodies. That was the foot in the door, now government is dumping billions upon billions into the private U.S. national economy on an individual basis inflating and driving the cost of living higher and higher. Without the government dumping all of these billions into the private economy on an individual basis it would be impossible for food prices and hospital bills to get above what the poor could pay. There is only one way the government can aid the poor and needy and not eventually collapse our U.S. economy: Government must establish or contract out its own commissaries, clinics, and housing units and use separate token or scrip for all who qualify. That way all of the billions won't be getting into the national economy on an individual basis contaminating and driving the cost of living out of sight. The amount of government spending is not the problem, it is the "Individual basis" spending dumped into the private national economy that does the damage. Mr. Trump has saved the Supreme Court, and as for as I'm concerned that was a Godsend. Never forget, we live in a well-established liberal welfare state, and liberals dominate education, the news media, and the minds of our young, which is our future. So, I can't see Mr. Trump and the republicans prevailing in the long run unless the 1938 socialist minimum wage law is repealed and the government stops dumping on an individual basis billions of dollars into our national economy. Like the Dem's at all cost they rammed Obama care down the nation's throat, now while the republicans have the chance they had better at all cost do what they must to save this great nation. This nation is culturally and morally bankrupted to the core and teetering on a total financial collapse. And the Dem's and liberals has no clue. Lord have mercy on this nation's sole. The Dem's and liberals are like zombies program to tax, tax, tax, and spend, spend, spend as if ignorance is bliss. Still, I love um; we are all Americans (USA) and our brothers' keepers. SIRMANS LOG: 04 JANUARY 2017, 1530 HOURS.